Articular cartilage is the white tissue lining the end of bones where these bones connect to form joints. Cartilage acts as cushioning material and helps in smooth gliding of bones during movement. An injury to the joint may damage this cartilage which cannot repair on its own. Cartilage can be damaged with increasing age, normal wear and tear, or trauma. Damaged cartilage cannot cushion the joints during movement and the joints may rub over each other causing severe pain and inflammation. Cartilage restoration is a category of surgical procedures where orthopaedic surgeons stimulate the growth of new cartilage that restores the normal function. Arthritis can be delayed or prevented through these procedure. Several techniques are employed for cartilage restoration including microfracture, enhanced microfracture, osteochondral autograft and allograft transplantation, and autologous chondrocyte implantation (MACI). Microfracture: In this method numerous holes are created in the injured joint surface using a sharp tool. This procedure stimulates healing response by creating new blood supply. Blood supply results in growth of new cartilage. However, this type of cartilage is called fibrocartilage and does not have the same microstructural properties of your normal hyaline/articular cartilage. Thus, this procedure has fallen out of favor in Dr. Patel’s practice. 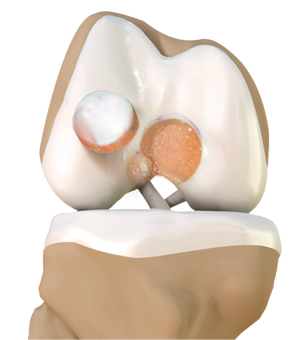 Enhanced microfracture refers to techniques that augment standard microfracture techniques to induce the formation of more normal articular or hyaline cartilage. Osteochondral Autograft Transplantation: Healthy bone and cartilage plug (graft) is taken from the bone that bears less weight and is transferred to the injured bone and cartilage location. This method is used for smaller cartilage defects; typically less than 1cm in size. Osteochondral Allograft Transplantation: A bone and cartilage plug (graft) is taken from a donor and transplanted to the site of the injury. Allograft technique is recommended if larger part of cartilage is damaged. Autologous Chondrocyte Implantation: This is a two-stage technique. In the first surgery, a small piece of healthy cartilage from a non-functional site of the knee is harvested using arthroscopic technique and is processed and grown in a laboratory. Cultured cartilage cells (patient’s own cells) form a larger cellular membrane, which is then implanted in the damaged part during a second open surgery. The newest generation of this technology is called Matrix induced Autologous Chondrocyte Implantation aka MACI.